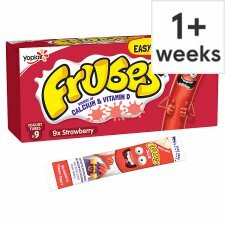 Frubes yogurt tubes are the perfect on the go yogurt snack for kids lunchboxes, with new and improved easy open tubes! For best results, remove from freezer 2-3 minutes before consuming. Please cut off end of tube with scissors before serving to children. If freezing, place in freezer immediately after purchase.